The ScoringLive All-Hawaii Division II Baseball team is a compilation of 12 individuals who dominated baseball parks this season. The complete first team includes players from four different leagues in the state. 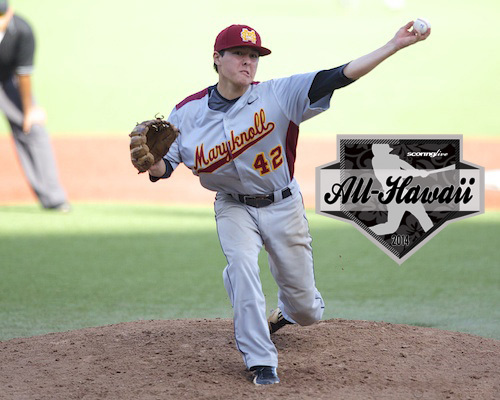 Headlining the selection with the first ever ScoringLive Division II All-Hawaii Baseball team is Player of the Year, Maryknoll pitcher Joshua Muneno. The Spartans claimed their second straight state title in 2014, with a lot of their success riding on Muneno's arm. By all accounts, the junior pitcher was in essence perfect, sporting a 9-0 record with two saves on the year. Muneno finished the year with 40 strikeouts and a 1.03 ERA in 54.6 innings pitched. One of the things that made Muneno clear-cut pick for Player of the Year was that he saved his most impressive performance for the state title game against Kamehameha-Hawaii. The Maryknoll ace fired a one-hitter in the contest, allowing the Spartans to cruise to the championship. Muneno was also selected as the Division II state tournament's Most Outstanding Player as well as the Division II Interscholastic League of Honolulu's Player of the Year. Joining Muneno as pitchers on the first team are Kauai's Cal Koga and Waianae's Kekoa Kaluhiokalani Jr., both of whom claimed Player of the Year honors in their respective leagues. Koga was dominant in the opening round of the state tournament, fanning eight batters in an 8-0 victory over Maui Interscholastic League champion Molokai. Kaluhiokalani was perfect (5-0) in the regular season, leading the Seariders to an Oahu Interscholastic Association White Division title. The senior right-handed pitcher finished the season with 25 strikeouts against 11 walks. Making the first team as a catcher is Kamehameha-Hawaii's Makoa Rosario. The 5-foot-8 senior batted .419 on the season. Rosario could also potentially be taken in the Major League Baseball first-year player draft this weekend. Scouts have timed Rosario's throw to second base at 1.85 seconds. The infield consists of Damien first basemen Kody Tamashiro, Maryknoll second basemen Justin Ushio, Waianae third basemen Jerzey Ramento-Acosta and Kamehameha-Hawaii shortstop Daylen Calicdan. Tamashiro hit .404 and drove in 16 runs in 2014. Ushio was a veteran leader for state champion Maryknoll, pacing the team with a .415 batting average and 22 RBIs. Ramento-Acosta was 17-for-36 in 2014, one hit shy of a .500 average. Calicdan had an impressive performance in the state semifinal game against Waianae, going 2-for-3 with four RBIs, a double and a run scored. In the outfield we have Maryknoll's Michael Nishiki, Saint Francis' Ranan Mamiya and Kauai's Kanoa Iwasaki. Nishiki was key Maryknoll's state tournament run, hitting .583 with four RBIs over the three-day course. Although Saint Francis did not make the state tournament, Mamiya had Maryknoll's number over the course of the season, batting in safely in all five meetings against the Spartans. Iwasaki was also impressive against the Spartans, going 2-for-4 with an RBI and stolen base in the state semifinals. Rounding out the 12-man unit as a utility player is Big Island Interscholastic Federation Division II Player of the Year Chay Toson. The 5-foot-8 senior spent time in the outfield and on the mound. As a batter, Toson hit .386 with 15 RBIs in 2014. As a pitcher, Toson (6-2) struck out 43 against 24 hits and 34 walks. The inaugural Division II All-Hawaii Baseball Coach of the Year award goes to Maryknoll coach Randy Yamashiro. Under the guidance of Yamashiro, the Spartans finished with a 18-3 record, claiming their second straight state title in as many years.